Models project that extreme dust events combined with global warming could advance the spring thaw in the mountains of the Upper Colorado River Basin by as many as 6 weeks by 2050. The earlier disappearance of snow could amplify water disputes, extend the fire season, and stress aquatic ecosystems. The maps at right suggest one strategy that water managers in the West could use to lessen the impacts of climate change: reduce blowing dust. Each image shows model projections of how much earlier in the spring the "snow-all-gone" day would arrive by 2050 compared to today based on the same amount of warming but different levels of dust. Positive days (brown) mean the snow disappears earlier in the spring. (Details on the modeling are at the end of this post). The mountain snowpack in the Upper Colorado River Basin is a natural, frozen reservoir that melts its way into streams and rivers throughout late spring and early summer. Some years, huge amounts of dust blow in from the Southwest, dirtying the snow. The darker snow absorbs more sunlight and melts faster than normal. In those years, the spring thaw—marked by the arrival of the "snow-all-gone" date—can arrive more than a month earlier than normal. If better soil conservation brought dust down to low levels (left-most map), models project that the average snow-all-gone date would increase by fewer than 20 days (lighter browns) for most of the area (this is for a relatively high greenhouse gas emissions scenario). In a few areas, snow might even linger a bit longer (green areas) than it currently does because models also project some localized increases in snowfall in high, cold terrain. But regular occurrence of extreme dust levels (right-most map)—which researchers modeled after unprecedented dust conditions witnessed in 2009 and 2010—could lead to winter snows disappearing 40 or more days (darkest browns) earlier in the spring than they currently do. Given that the snow-all-gone date already arrives about three weeks earlier than it once did, the change would amount to a roughly nine-week advance in the snow-all-gone date. 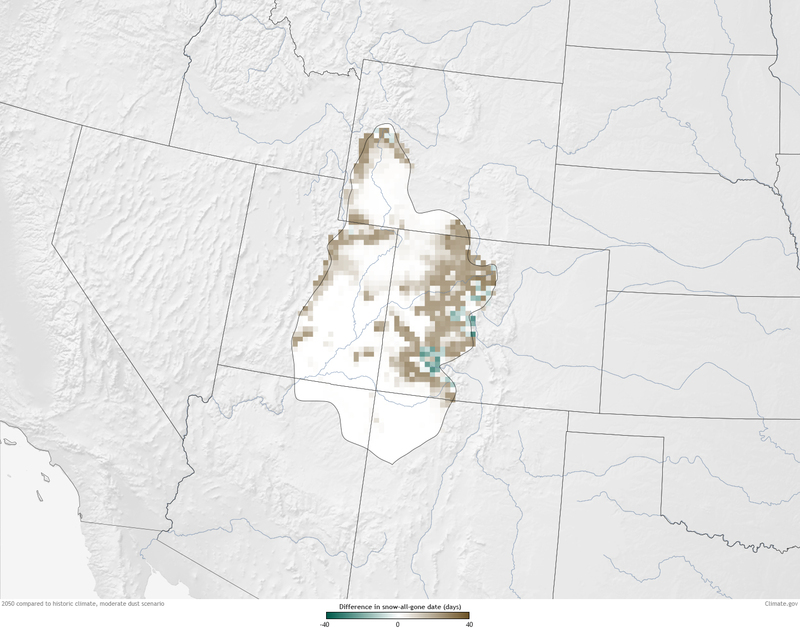 The early disappearance of snow could further add to water supply problems in the already over-allocated river, especially in the Upper Colorado River Basin, which lacks the big reservoirs of the Lower Colorado. Earlier arrival of snow-all-gone dates also means a longer dry season, which would increase fire risk and stress aquatic ecosystems. The Colorado River supplies water to an estimated 40 million people in the United States and Mexico, and it is already the focal point of heated water disputes among cities, farmers, ranchers, and agencies that protect wildlife. Presently, dust has a bigger impact on spring melt than warming. Climate change alone is likely to advance the snow-all-gone date in the Upper Colorado River Basin, but high levels of dust will only make the problem worse. The new research identifies a risk to water supplies, but suggests an opportunity for adaptation. The high levels of dust blowing out of the Southwest are due to more than a century of inadequate soil conservation in the area's dry, fragile soils. Restoring landscapes that have been damaged—by grazing, mining, energy exploration and development, farming, and off-road travel—to reduce blowing dust could keep a potentially manageable problem from turning into a major one. These maps show projected differences between different model scenarios constrained by historic climate data and observations of how dust changes the reflectiveness (albedo) of snow. To represent the present-day conditions, the scientists linked a climate model to a water cycle model to estimate what the likely snow-all-gone dates would be with the climate conditions of the past century or so (1915-2003) and moderate dust levels, similar to what the region experienced between 2005 and 2008. Next they simulated the snow-all-gone dates in 2050 with different levels of dust if greenhouse gas emissions continued to be high (a scenario known among the climate scientists as "A2") or if they become somewhat lower starting in mid-century (a scenario called "B1"). Finally, they compared the snow-all-gone dates predicted for the decade centered on 2050 and the decade ending on 2100 to the present-day conditions. While the projected warming was less for the lower-emissions scenario, the impact of extreme dust was still significant. Deems, J. S., Painter, T. H., Barsugli, J. J., Belnap, J. and Udall, B.: Combined impacts of current and future dust deposition and regional warming on Colorado River Basin snow dynamics and hydrology, Hydrol. Earth Syst. Sci., 17(11), 4401–4413, doi:10.5194/hess-17-4401-2013, 2013.